New regulations have been passed where dental practices can be inspected at any time without notice. This is to check to see if infection control standards are being met. If a dental practice fails to meet these strict standards, it can be shut down on the spot. Unfortunately, you may have seen some of these rogue dental practices in the news from time to time. Here at More Smiles, we have always taken infection control very seriously. We are dealing with saliva and other bodily fluids that can potentially spread infection and disease. 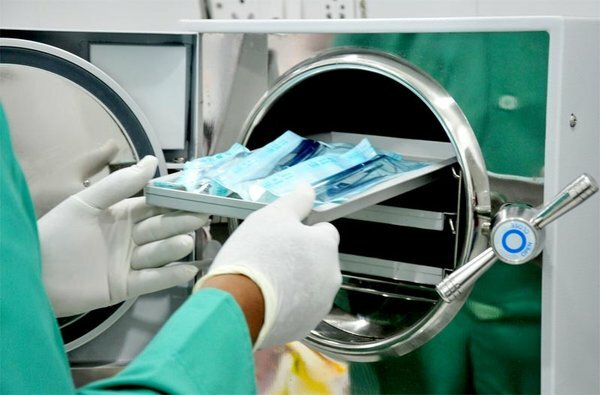 To prevent this, our instruments are disinfected in an ultrasonic machine and then sterilized in another machine called an autoclave. Once this has been done, the instruments are then bagged, tracked and recorded so that we have evidence to prove that they are safe to use. You may have also noticed that we have plastic barriers over certain parts of the dental chair. This is to prevent complex parts that are tricky to clean from getting contaminated. These barriers are replaced for every single patient. The chair is also wiped down with disinfectant and a clean tray carrying sterilised instruments is setup. A special alcohol rubbing gel on our hands between patients is actually more effective at killing bacteria than washing our hands with water the traditional way. Latex-free gloves as well as a mask and safety glasses are also worn to protect us as well as our patients. Part of our duty in caring for your mouth is to protect the rest of your health as well. This blog hopefully gave you some insight into how much care and attention is taken for every single one of our patients. We look forward to seeing you at your next dental appointment.